If you thought the pace of the head-spinning political events of the last two months couldn't get any faster, think again. One of the most critical decisions of President-Elect Trump's reign will soon be decided. The final verdict will have a direct impact on the direction of stocks, gold, and the economy in the months to come. The decision in question is the Congressional challenge being made against the Affordable Care Act (ACA), also known as Obamacare. Specifically, the requirement that individual Americans carry health insurance or else pay a stiff financial penalty is being challenged. Earlier this week, Trump directed the Republican-led Congress to begin efforts at repealing and replacing the health care law "very quickly." The mainstream news media is sparing no expense in its efforts at turning public sentiment against a repeal of the healthcare law. CNBC reports that "the number of people who owed Obamacare fines last year dropped by about 20 percent, while the number of Americans who benefited from financial aid for Obamacare plans grew to more than 5 million." The latest data was culled from 2015 tax returns to the Internal Revenue Service. IRS Commissioner John Koskinen said the number of people receiving Obamacare subsidies was up from 3 million in 2014. For that year, customers got more than $10 billion in tax credits, with an average subsidy of $3,430 annually, according to the IRS. Obamacare subsidies are available to wage earners with low and moderate incomes. People who earn less money get more in assistance than higher earners. Koskinen wrote that about 6.5 million taxpayers last tax season reported owing a total of $3 billion in such tax penalties for failing to have coverage in 2015. In contrast, about 8 million people owed an Obamacare fine for lack of coverage in 2014. Fines related to lack of coverage in 2014 totaled $1.6 billion. CNBC reported that some 12.7 million people claimed one or more exemptions from the ACA-coverage mandate when they filed their taxes last year. "The exemptions are wide ranging and can include having very low income, being incarcerated or having a close family member die recently," according to CNBC. While pro-Obamacare media outlets such as CNBC are touting this news as confirmation that the ACA is "working," the gorilla in the room is conveniently ignored. The reason for the decline in Obamacare fines last year is that millions of Americans experienced a significant drop in income, which ironically is a direct result of the economic damage inflicted on businesses by the financial strictures of the ACA. CNBC also reported that the Republican-led Congress last week began taking steps toward repealing key parts of the ACA, which include the funding of premium subsidies and the individual mandate. For the middle class's economic sake, let's hope the effort is successful. You may be asking what all of this has to do with the price of gold or the stock market. The answer is "everything!" Repealing the individual mandate would serve as a huge catalyst for the U.S. economy and financial market. It would lift a grievous burden from the shoulders of working-class Americans and would serve as a stimulus to consumer spending. Economics 101 establishes that when wage earners are allowed to keep more of their income, they're less likely to think twice about spending and investing it. One of the big reasons for the Nowhere-ville sideways trend in stock prices in the last couple of years is because people have been forced to think twice before spending or allocating money into investments due to the constraints of the ACA. Pollsters have consistently underestimated the number of healthy individuals who choose not to carry expensive health insurance because they don't consumer healthcare services. Now those healthy individuals are being punished for their lifestyle choices by being forced to pay upwards of $1,000 per year in the Obamacare tax simply because they choose not to be insured. This is an assault on personal liberty and common sense, and it has created a massive obstacle to full economic recovery. What can investors expect if the Obamacare tax penalty is soon repealed? First, there will be an immediate uptick in consumer spending and overall economic activity. Americans are always looking for an excuse to spend, and if they're provided with what amounts to a massive tax cut they'll express their relief by purchasing the items on their wish list that they've held off on buying due to personal budget constraints. Businesses, moreover, will begin to pick up the pace of hiring since the healthcare mandate is no longer acting to suppress business investment spending. A repeal of the ACA's individual mandate would also revive the fortunes of publicly traded companies which serve the middle class. 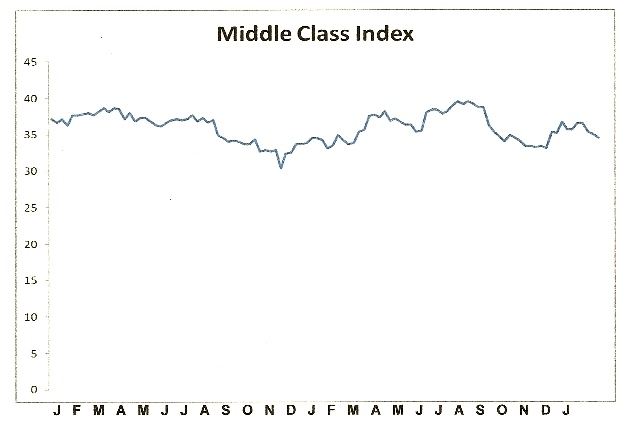 Many of these companies' stocks are components in our Middle Class Index (below). The Index has been languishing for the last two years, but I'd venture that an upside breakout from the lateral trading range would shortly follow an Obamacare repeal. As for gold, a repeal of the individual mandate would also likely have far-reaching consequences. Gold's fortunes would be helped, ironically, by success in getting the Obamacare tax removed. While gold is primarily a safe-haven asset which feeds off investors' concerns about the economic and political outlook, gold's moves over the last two years have been closely correlated to the direction of the Middle Class Index. As the fortunes of companies which serve middle class consumers have risen, so has gold's price. 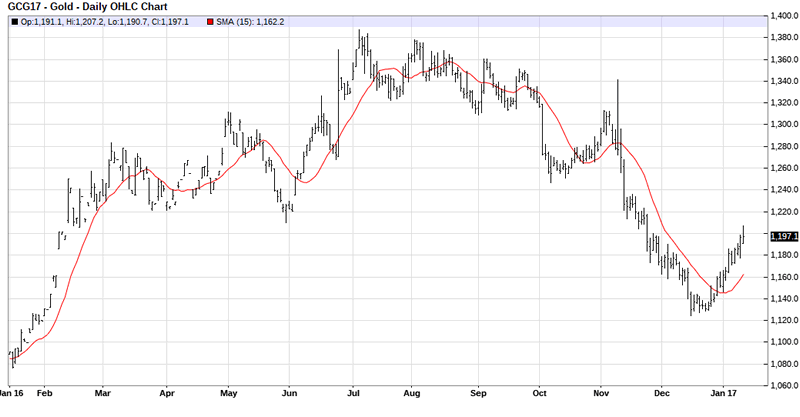 Conversely, last year's major peak and subsequent decline in the Index has coincided with the July 2016 peak in the gold price and corresponding mini-collapse. The moving average is one of the most versatile of all trading tools and should be a part of every investor's arsenal. Far more than a simple trend line, it's also a dynamic momentum indicator as well as a means of identifying support and resistance across variable time frames. It can also be used in place of an overbought/oversold oscillator when used in relationship to the price of the stock or ETF you're trading in. In my latest book, Mastering Moving Averages, I remove the mystique behind stock and ETF trading and reveal a simple and reliable system that allows retail traders to profit from both up and down moves in the market. The trading techniques discussed in the book have been carefully calibrated to match today's fast-moving and sometimes volatile market environment. If you're interested in moving average trading techniques, you'll want to read this book.